Why is it that our response is so different when a friend knocks over their glass of wine in a restaurant, versus when our child spills their drink? Why, when our child’s legs are tired do we continue to drag them along at our speed, but for a friend we’d slow to match their pace? This happens, even to the kindest of us, when we forget that our children are people too. We’re not saying to treat our children as adults, but with at least as much kindness and grace. It’s a simple premise, but can be hard to put into practice. We tend to reserve our best responses for the adults around us, and our children bear the brunt of our stress, impatience, and bad moods. We respond to them in ways we’d never speak to a friend, or wish on ourselves. We need to be conscious of when this is happening so we can actively work on stopping, and changing that pattern. Tuning into our child is so important, but so is tuning into ourselves. If we freeze frame a situation and play back our role in it, we can give it a ‘quality check’. Did our interaction meet our standards of kind and fair? Were we aiming to connect or control? Did we treat them as a person, or as an ‘other’? If that was our friend, would they actively be seeking out our company in the future? 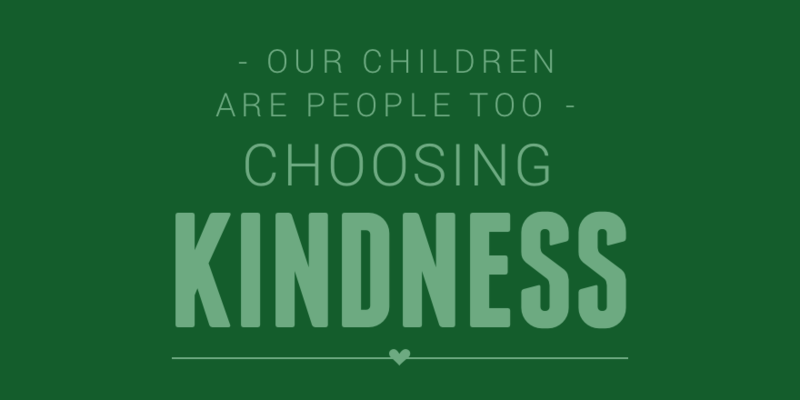 If we didn’t measure up in the kindness stakes, we can take stock, and work to repair our relationship with our child. They are very forgiving, and we are role modelling the imperfection of humanity when we apologise, and try harder. Our children are often the easy target for our less than best selves, regardless of what is triggering us. Our behaviour is not a result of theirs. It is entirely on us, the adult in the relationship. It’s not their role to ‘fix’ us, or our connection with them. That’s on us. We have to consciously choose, and keep on choosing, kindness. Pausing before we respond, noticing the positives and ignoring others, and finding ways to identify and deal with outside stressors - this is our task. This is adulting, and this is certainly parenting.